One thing that becomes readily apparent: all the deciduous trees, shorn by the winter’s inclemency of their verdant foliage, create some serious issues for photography. All the bare branches kind of blend in with the reddish brown and poorly lit walls. 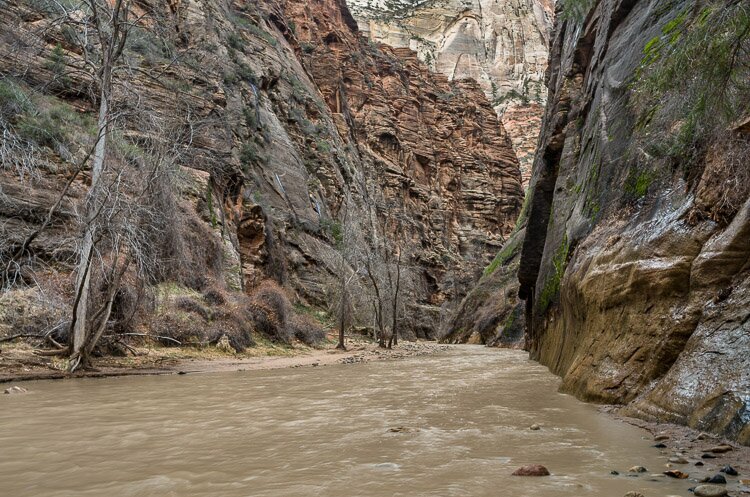 In addition, the Virgin River, swollen by rains, has been darkened into a muddy color by all the silt and dirt dredge up by the rains. This can be a scenic place, say, in the spring, with the green leaves spouting fresh from their bows, or in autumn, with the leaves turning yellow and gold. Nonetheless, the following pictures tell a story: of the Riverside Walk in the depths of February, under (mostly) gray and forbidding skies.